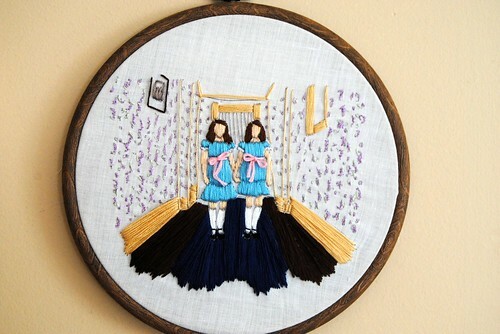 If you've seen The Shining, you know exactly who these little girls are. Amy did an awesome job stitching this up - I love that she left the girls faceless, for an added creepy touch. Great work! WOW - that is amazing! Amy did a beautiful job! I love the movie so immediately I knew - they are perfect! Right down to the vintage looking wallpaper - very talented lady! I LOVE this piece. The Shining is one of my all time favs too! Deliciously creepy - love it! The wallpaper detail is amazing. That's exactly who I thought they were, how spookey. Well done. This is so creepy and awesome! She is such a talent though... the first time I saw her embroidered tweets, I was nearly brought to tears from laughing so hard. I especially love what Amy did for the wallpaper. Very clever! Aaahhhh, that is too funny, I love it so much!!!!!!! Think I'll go watch the movie! No faces - awesome creepy touch. What I find most interesting is the way Amy did the perspective. It feels like a real hall. Oo that made shivers go down my spine! creepy and lovely! Love it! I want it, but it also freaks me out. Amazing capture of that eerie scene!! How about some lettering (eg see below)?